See the local time and date clearly and precisely in all of your trading regions, operational areas or countries of interest. Wharton 4750N.05 series time and date world clocks have either white printed or programmable illuminated location names. 10/100Base-t Ethernet NTP for simple network configuration and time synchronization. 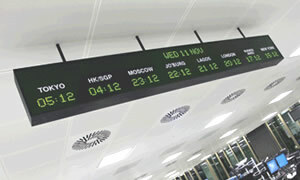 Can be operated stand-alone, synchronised to many different time references or as part of a networked system. Select 110-230V AC, 12V or 24V DC power supply. High quality cases. Choose from surface, or single or double side ceiling suspension mounting. IR handset for time-setting and configuration.